Japan is simply squandering an opportunity to break new ground after Fukushima. By any logic, Japan should be a vehemently anti-nuclear country by now. Japanese Prime Minister Abe is adamant that nuclear power remains at the heart of the country’s energy policy. The number and intensity of anti-nuclear protests in Japan have been in a steady decline. Fukushima led Merkel to shut down Germany’s 17 nuclear reactors that provided 18% of the country’s energy needs. For Japanese anti-nuclear activists, Germany’s response to Fukushima is precisely what Japan should be doing. Instead of using the nuclear disaster, Japan is squandering an opportunity to break new ground. Fukushima should be a wake-up call for Japan to reassess its future industrial priorities. By any logic, Japan should be a vehemently anti-nuclear country by now. And yet Tokyo voters ultimately voiced their support for a nuclear Japan as they supported the man who made clear his hopes to restart the nation’s dormant reactors. Former health minister Yoichi Masuzoe easily won last weekend’s Tokyo gubernatorial elections against former Prime Minister Morihiro Hosoka whose campaign platform was to keep the country free of nuclear power. Support for Masuzoe was also in effect a vote for Prime Minister Shinzo Abe and his Liberal Democratic Party, which views nuclear power as critical for sustainable economic growth. Japan’s nuclear ambivalence has taken a while to brew, unlike in Germany, where Chancellor Angela Merkel vowed to forsake nuclear power shortly after the 2011 Fukushima disaster and remains committed to that policy. But while all of Japan’s reactors are currently idle, Abe has repeatedly stated that nuclear energy remains critical for his country to remain competitive in the global economy. That view is shared by much of the nation’s leading business leaders, among others. It is quite a surprise that this view persists despite continued leakage of contaminated water from the Fukushima power plant, which was crippled as a result of a massive tsunami wave following a 9.0 magnitude earthquake. Germany, on the other hand, viewed Fukushima as the ultimate lesson for the country to reject nuclear power altogether. The accident led Merkel and her conservative Christian Democratic Party to side with the Green Party to shut down Germany’s 17 nuclear reactors that provided 18% of the country’s energy needs. In order to offset that decline, Merkel has stepped up German efforts to develop alternative energy sources including solar and offshore wind in the North Sea. For Japanese anti-nuclear activists, Germany’s response to Fukushima is precisely what Japan should be doing. 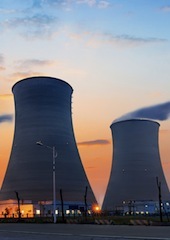 Nuclear power has provided about 30% of Japan’s energy needs. However, the idling of the country’s reactors has yet to jump-start investments in renewable technologies. The hesitation to do so is due, in part, to the prime minister’s insistence that a re-powering of reactors should be only a matter of time, not principle. In short, a question of the “when” – not the “if.” The LDP is proposing to restart at least 12 reactors as an integral part of keeping Japan’s still fragile economic engine on track. Instead of using the nuclear disaster as an opportunity to make lemonade out of lemons, Japan is simply squandering an opportunity to break new ground. Of course, while some traditionalists are making the best of the change, Germany’s decision to vow against the nuclear option is not without its critics. For one, development of renewable energy supplies that can meet current industrial needs will take time. It will also be a very expensive investment in the near-term and means higher energy costs for consumers. The price tag to meet energy needs in Germany will rise significantly in the near term as well. The Institute for Energy Research estimates that Germany’s electricity rate can increase by 10% this year and rise another 30 to 50% over the next decade. Still, the cost of continuing to depend on nuclear energy and not putting money into developing new energy sources may be still higher in the longer term. If nothing else, Fukushima has highlighted the risks of controlling nuclear reactors even with the best of plans and highest of standards. Meanwhile, not investing in alternative energy sources now and remaining petroleum-dependent has a clear strategic disadvantage: Japan will remain dependent on resources from some of the world’s most politically unstable regions. Advances in fracking technology, if they really bear out in an environmentally safe and responsible fashion, mean that both the United States and Europe will become less and less dependent on Middle Eastern oil, as they are better able to tap into these natural gas supplies. That would leave Asia as the sole region that will rely on imported petroleum at current levels. One of Japan’s hopes to offset some of its dependence on Middle Eastern petroleum is to tap into the natural gas supply from the United States. U.S. gas supply is expected to exceed domestic demand within the next decade and bilateral efforts to allow the United States to export excess gas to Japan are currently underway. That, however, would be a wasted opportunity for Japan. Given the continued slide of the Japanese manufacturing sector, Japan can ill-afford to delay investing heavily in industries that could take its place. Japanese carmakers have taken the lead in developing energy efficiency. Hence, the prospect of Japanese companies becoming world leaders in renewable energy technology is hardly far-fetched. Fukushima should be a wake-up call for Japan not only to reconsider its nuclear energy policy, but also to reassess its future industrial priorities. This is not the time to rebuild what Japan has been. It should be an opportunity to build up Japan to what it can be, despite the costs in the near term. But in the near term, as Tokyo voters head to the polls, their support for Hosokawa will mean a resounding yes for endeavors to keep Japan nuclear-free, while a vote for Masuzoe will spell yes for a resumption of nuclear power dependence. This feature, originally published on October 24, 2013, was updated in view of the results of Tokyo’s gubernatorial election on February 9, 2014.